Welcome to a Soothing & Comforting Touch Massage Therapy, Inc. where you are the special guest. Your mind, body, and soul will be filled with rejuvenation. Start with one or a combination of our appetizers that will soothe the hunger of your appetite to be comforted by our massage therapists. Take five to twenty five minutes of your day and pamper yourself. Let the heat and essential oils deeply penetrate into the hands and feet, for a nice result of smoothness and refreshing aroma. If you thought you could not get enough with the appetizers, wait until you try the main course. These succulent entrees will leave you relaxed and begging for more. Warning: You will be so relaxed we may need to call you a cab to get you to your next destination. Choose any amount of time from half an hour to two hours for only $1.00/minute. This basic relaxation massage will leave you feeling like royalty. Ever wanted to get rid of the skin you are in? This full body scrub and massage will have you believing you were born-anew. Your skin will feel soft and luxurious. Anya can help you lose weight with her incredible exercise program. With accurate measurements to a healthy lifestyle and a great exercise program you will definitely see results. Massage Party (Table) : There is a minimal requirement of 4 persons per table party, and each full body massage lasts a clinical hour of 50 minutes. All events require a $25 surcharge and a non-refundable deposit of $50.00. A 50% cancellation fee will be charged/billed to the booking party if cancelled less than 48 hours before the event. For the half hour massages all events require a $25 surcharge and a non-refundable deposit of $50. A 50% cancellation fee will be charged to the booking party if cancelled less than 48 hours before the event. All events require a $25 surcharge and a non-refundable deposit of $50. A 50% Cancellation fee will be charged to the booking party if cancelled less than 48 hours before the event. A perfect way to introduce your child to massage, this experience will help your child learn to deal with future stress or sports injuries. This mini facial is designed to introduce the basics of good skin care and is a fun and educational way to healthy skin. We soak little feet and hands in a lavender or green tea bath, then we trim nails and apply cooling moisturizer lotion. 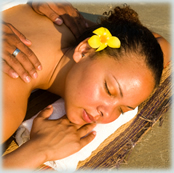 Do you feel more comfortable receiving your massage in the privacy of your own home? Let us come to you. You will still enjoy the relaxing atmosphere we provide in-house. Send an email today and a therapist will reply to you within 24 hours. If you need immediate assistance feel free to call 864-303-5056. *Please note that there is $25.00 trip fee.